Erosion is a natural process associated with stream flow. Streams in steep channels tend to cut straight down to bedrock or a boulder bed unless diverted by natural or human-made barriers. In gently sloping areas the shape of a stream channel usually evolves at a leisurely pace, with a tendency to meander and to develop a sequence of pools and riffles. Meandering channels have a natural rhythm, eroding the outside of each bend, and depositing material on the inside of each bend. In general, meanders change shape slowly in response to natural or artificial variations in flow patterns. 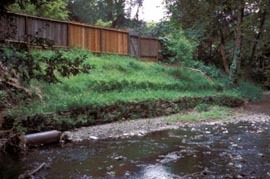 However, there are exceptions to this behavior: in 1867 an obstruction in San Anselmo Creek near Laurel Avenue closed off the original channel and turned the creek through a right-angle to its present route. 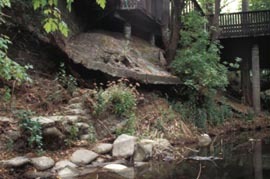 Within the Corte Madera Creek watershed, many stream reaches have been channelized with vertical walls and riprap (large boulders) or have disappeared entirely into culverts in an attempt to improve drainage and control erosion. Such modifications can have unintended and problematic consequences: water is a powerful force and often unpredictable. Minor adjustments in channel shape can sometimes create extreme problems that have far-reaching effects. A traditional way to deal with stream-bank failure is to armor the bank by placing riprap at the point of erosion. However a subsequent storm flow may dislodge the rocks and carry them downstream of the attempted repair to a location where they cause flooding by partially damming the stream channel. Another common erosion control measure is the construction of retaining walls of wood or concrete; these speed the flow, and can lead to the erosion of downstream banks. Failure to foresee the possible consequences of drainage modifications has sometimes led to the drafting of public policies that are actually detrimental to property. For example, for many years, pavement construction standards in Marin called for any rain reaching a paved surface to be directed into local creeks through a system of gutters, culverts, and storm drains. The forces of these unimpeded flows continue to contribute to unnaturally rapid erosion of stream banks within the Corte Madera Creek watershed. 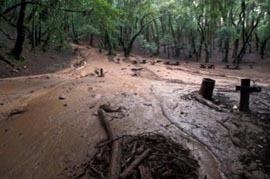 In recent years the County, in collaboration with Marin’s 11 cities and towns, has taken a more holistic approach to dealing with water flows and erosion control, with the Marin County Stormwater Pollution Prevention Program (MCSTOPPP) taking the lead in informing the public about new policies and recommended techniques. MCSTOPPP provides a wealth of information free of charge. 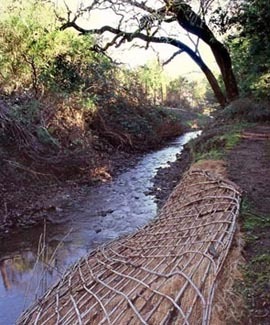 Three of MCSTOPPP’s publications provide particularly useful information for streamside settings: Creek Care: A Guide for Urban Marin Residents; Repairing Streambank Erosion; and Controlling Erosion. The Marin County Flood Control District, the Resource Conservation District, the California Department of Fish and Game, and the U.S. Natural Resource Conservation Service are other valuable sources of information. Examine your property carefully before disturbing the soil. Be aware of the slope, drainage patterns, and soil types. Preserve existing vegetation as much as possible. Minimize the length and steepness of slopes by terracing or constructing diversion structures such as earthen dikes or temporary assemblages of brush and tree branches to diffuse water flow. Use alternatives to impervious concrete. If you are installing a new patio or rebuilding a crumbling walkway, consider using bricks, interlocking pavers, or flagstone. If placed on well-drained soil or on a sand-and-gravel bed, modular pavers allow rainwater infiltration. A layer of landscape fabric beneath the gravel will suppress weed growth between the pavers. Limit vehicle and foot traffic in sensitive, sloping areas. The compaction of roads and trails often lead to erosion problems. Compacted soil restricts the root growth that can restrain the soil and maintain the porosity of soil. Plant vegetation. Vegetation is the best means of controlling soil loss because it stabilizes soil, intercepts rainfall, and takes up water. Grass provides the cheapest and most effective short-term erosion control. Check with a native plant nursery for varieties suitable to your area. Native perennial bunch grasses, shrubs and trees provide longer-term erosion protection than fast-growing but less-tenacious annuals. Use fencing to protect new plants from foot traffic and deer. Use erosion control fabric. Mats of jute or coir netting, excelsior, and straw fibers help keep soil in place through rainy weather, giving vegetation time to become established. To be effective, mats must be in close contact with the soil and fastened securely. Prevent erosion from roof drainage. Avoid directing downspouts onto bare earth. However, lawns and friable garden soil might be permeable enough to absorb roof runoff if it is distributed over a broad area by means of a dispersion attachment to the downspout. These are sold at home and garden supply stores. The first question you might want to ask yourself when contemplating what to do about a streambank erosion problem is: Does this really need to be fixed? Consider how active or stable the situation is and what the potential is for damage to property or surrounding habitat. If plants are growing on the bank, this indicates that recent erosion has been minimal. Is the situation threatening structures, roads, or infrastructure? Does it appear to be caused by human negligence? Put on your rain gear and observe what happens during a storm. If the problem is due to surface flow, it might be possible to remedy it by dissipating the force, perhaps by securing tree branches or brush along the rivulets to break up the flow. Strategically placed embedded rocks can also help, but keep in mind that you are dealing with a dynamic situation. Check up on the area periodically during the rainy season; you will probably need to make modifications from time to time. Finding the source of a streambank erosion problem might not be as simple as you first imagine. While you might think that surface flow is the cause, for example, it could be that a thick growth of blackberry or other vegetation is obscuring a groundwater seep that is the true culprit. Seeps frequently surface along streambanks. If you trace the erosion to a seep, consider the possibility that a leaky water line is to blame, particularly if the problem developed recently. It also could be that the problem is not due to a nearby inflow but rather to some alteration in the stream course upstream or downstream, that is affecting your property. Walk up and down the stream and look for signs of recent changes. If no easy solution becomes obvious you might benefit from assistance from an engineer or an environmental restoration specialist, who should be able to suggest a range of alternatives that incorporate vegetation and do not jeopardize other people’s properties. If you see a need for modifications to the stream course, you will need agency permits. Most stream repair work requires a Streambed Alteration Agreement from the California Department of Fish and Game, and depending on the situation, the approval of other government agencies. The MCSTOPPP pamphlet Repairing Streambed Erosion gives a good overview of erosion-control options and permitting requirements. The county Flood Control District’s Groundwork: A Handbook for Erosion Control in North Coastal California is another good source of information.